Robit Rocktools is a Finnish company that serves the mining and construction industries. The company’s highly-specialised offerings consist of top hammer rock drilling tools and DTH ground drilling tools. With roots embedded in the hard Scandinavian granite and Finnish mining industries, Robit Rocktools has expertise in drilling even the most challenging of rock types. Robit Rocktools product line covers all construction, quarrying and mining drill and blast applications, from the softest to the hardest of rock conditions. Tunnelling is one of the most important customer segments for Robit bits, and applications such as drifting and bolthole drilling are well catered for. 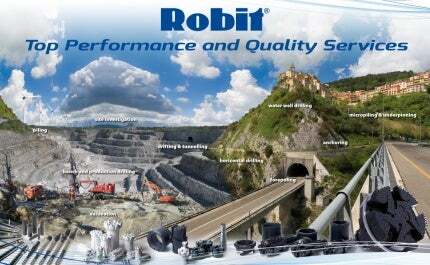 Robit Rocktools’ quality has been approved worldwide by major mining and quarrying customers. Robit Casing Systems are the key components of the ground drilling tools product line. Robit’s patented locking system enables easy and reliable drilling and is a cost-effective solution. Robit Casing Systems has been proven worldwide in all major ground drilling applications. These applications include forepoling, anchoring, piling and underpinning, horizontal drilling, water and thermal well drilling, soil investigation and monitoring and underwater drilling. Robit Rocktools is a world-class company headquartered in Finland, with a presence in more than 100 countries, through its successful partners. At present, Robit’s high-quality products are manufactured in two time zones and the company has its sales offices in the US, China and Russia. The driving force at Robit is to develop innovative solutions, which result from the company’s close co-operation between its customers, distributors and own personnel. Robit Rocktools’ market presence is continually growing, as it widens its range of products and improves its level of customer service. Robit Rocktools has been named company of the year in Finland 2014 by The Federation of Finnish Enterprises. Download the free catalogue for more information about Robit Rocktools' drifting and tunnelling, reaming and bench and production drilling equipment, as well as adapters and auxiliary tools.